Vancouver's Practicing Literati. Practice makes perfect, right? 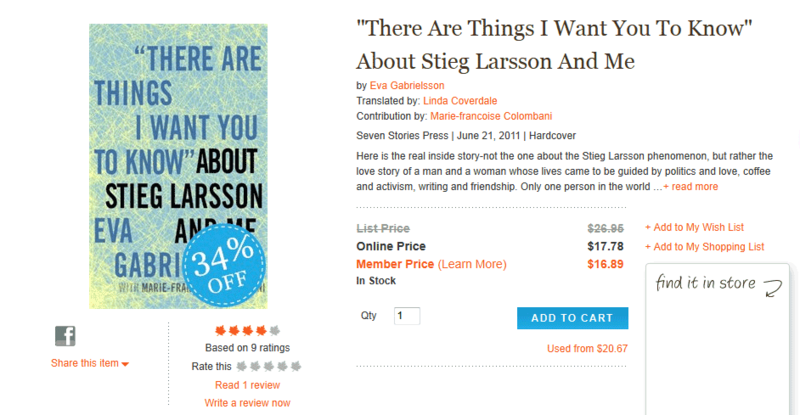 …but they don’t have anything directly to do with either Stieg Larsson or Eva Gabrielsson, per se. Just as with earlier this week, we have an example of what I can only call “price gouging”. Here’s today’s example. …which is only 99¢ less than the discounted price of the Hardcover edition of the work in the listing above it? Notice as well that the Recommended Retail Price for the electronic edition is identical to the RRP for the electronic edition. Let me remind you once again, don’t blame the un-identified retailers, they’re working with the RRP set by the publishers, which in this case is Seven Stories Press, who seem to be bound and determined to ensure no eBook is ever purchased by any individual in the history of man, just as Corgi and Transworld were earlier this week. Authors (even the dead ones): talk to the houses who publish your work and insist they no longer ignore the way their are slicing their own throats. Electronic bindings are not some sort of luxury, especially as one has already bought some fancy electronic goo-gaw to read the books on in the first place. They can make money through volume sold just as easily as if they locate the handful of people in the marketplace daft or rich enough to pay top dollar for the option of carrying less paper. Get the Shebeen Club delivered your inbox by Jimmy Olsen himself! Shebeen Club Reunion October 20! Job Opportunity in Yankistan: Mediaite is Hiring! raincoaster 49 degrees latitude, 360 degrees attitude!